Eugene's Blog: Japan's "Protestant Reformation"
Seemingly quite different religions, established in completely different parts of the world, evangelical in nature and structured upon well-established belief systems, often follow similar patterns of convergent social evolution. To take the metaphor a step further, like biological organisms, disparate religions expanding into new environments will diversify and adapt in predictable and similar ways according to predictable and similar timetables. Consider the parallels between doctrinal changes introduced into the practice of Buddhism in Japan and concordant changes in 16th century Christianity, and specifically the compelling similarities between both the theological and political substance of the Protestant Reformation in the mid-1500s and the emergence of a reformed Pure Land Buddhism two centuries before, along with its counter-reformation counterpart, Nichiren. According to the theory, the approximate 200 year head start that Japanese Buddhism enjoys is simply the result of chronology. The Emperor Asoka converted to Buddhism and established the first Buddhist State in the 3rd century BC. However, analogous in some ways to Christianity, Buddhism faltered in the land of its birth and was overtaken by Hinduism. Mahayana, the "Greater Vehicle" of Buddhism, emerged in the 1st century BC and eventually spread to China, Korea, Japan, Tibet, Central Asia, Vietnam, and Taiwan. When Saichou (767-822) and Kuukai (774-835), the two great patriarchs of Japanese Buddhism, returned to Japan from China in the early 9th century, they brought with them a fully-developed Mahayana Buddhism as then widely practiced in China. The Tendai and Shingon sects they founded are categorized as "Esoteric" Buddhism, and in outward appearance bear no small resemblance to Catholicism. Esoteric Buddhism relies on ritual and temple observances, on the tutelage of priests, on a tradition of monasticism. During the first millennium the imperial court embraced the new religion as had Constantine, for reasons of both spiritual and political expediency. The Confucian philosophies that had become entwined with Buddhism during its maturation in China provided an essential rationalization of imperial rule. Moreover, the religion was ideally suited to the aristocracy. At the end of their careers, emperors and warriors could retire to a temple or monastery and work out their salvation before death. In the early years of the second millennium, the Fujiwara regents were displaced and then their military overseers--the Taira--were overthrown. When the capital shifted to Kamakura in 1192 the resultant political upheaval triggered a rich outburst of religious diversification that saw the emergence of the three great, enduring sects of Japanese Buddhism and what could be called a Buddhist "Protestant Reformation." The most familiar to western observers is Zen, especially the Rinzai sect established by Eisai (1141-1215). Eisai began his studies at the Tendai temple on Mt. Hiei. During the second of his pilgrimages to China he was ordained into the Rinzai Zen sect. (Eisai is also credited for introducing tea agriculture to Japan.) His proselytizing was not kindly received by Kyoto's Tendai and Shingon communities, but with the founding of the Kamakura government Eisai found a patron in the shogun himself. Shogun Minamoto Yoriie subsequently appointed Eisei Chief Priest of Kennin Temple in Kyoto. At Kennin-ji Eisei went out of his way to accommodate Tendai and Shingon rituals and practices, thus diffusing some of the animosity directed towards the upstart religion. Dougen (1200-1253) studied at Kennin-ji under Eisei's disciple, Myouzen, and went onto found the Soutou school, which today is immediately (and perhaps stereotypically) recognizable for its focus on Zazen meditation, exemplified by the circular dialectic of the koan and the concept of "the Way" (Dou) to perfection as rooted in "no-mind" or unconscious action and satori. Zen became the Buddhist sect most closely associated with the psychology and the purely aesthetic sense of "being Japanese." Zen's adoption by the secular powers-that-be paradoxically precluded it from the entanglements of king-making. With its protected status, its infusion over ten centuries into all aspects of Japanese culture transmuted Zen into as much an ethos as a religion, akin to the "Protestant work ethic" and code of "rugged individualism" that Americans claim as defining of their character. Zen's almost transparent absorption into the "collective unconsciousness" makes it a less significant factor in this discussion. The Tendai and Shingon sects and their powerful monasteries, however, struggled hard to bolster their failing influence. The patronage of the movers and shakers of the Nara and Kyoto courts had indeed established Buddhism as the de facto state religion. But power corrupts, and petty differences among Shingon and Tendai adherents vying for say over the affairs of state often degraded into pitched battles. Hounen (1133-1212) was a Tendai priest at Enryaku-ji, the temple headquarters of the sect. Disillusioned with the decadence and corruption he saw around him, he turned to the Pure Land sect. Pure Land Buddhism was defined in its modern form by the 5th century Chinese monk Hui-yuan (334-417), who presaged Luther by promulgating a doctrine of salvation based not on effort and ritual, but on faith in the grace of the Amida Buddha and his infinite power and compassion. The Pure Land Sutras (scriptures) were brought to China from India in the second century AD. According to these sutras, Siddhartha Gautama, the historical Buddha, had in a previous life rejected Buddhahood. In this prior incarnation, as the transcendent Amida Buddha, he vowed to forestall his own enlightenment until it became possible to bestow eternal happiness in the Pure Land up all beings (including, importantly, women) who with faith would call upon his name. In his reinterpretation of Joudo (Japanese for Pure Land), Hounen further simplified the nenbutsu, essentially the Buddhism version of a crossing oneself and saying the Lord's Prayer. By de-emphasizing karma and rejecting the "works" associated with traditional Buddhist practice--asceticism, meditation and study--Hounen created a religion that could be comprehended and practiced by the laity, that held out a hope of salvation to the common man in his own lifetime. Hounen's disciple, Shinran (1173-1262), simplified Joudo further. Joudoshin, or New Pure Land Buddhism, held that reciting the nenbutsu just once would suffice, much in the same way that Christian evangelical preachers call on their listeners to "confess Christ." Shinran, like Luther, also rejected monasticism and a celibate priesthood. Today, the majority of Buddhist priests in Japan follow Pure Land traditions, marry and participate actively in their local communities. Amida vowed that after his enlightenment all his followers would be saved provided they had faith in him and recited his name. The fact that he has attained supreme enlightenment is proof that men can be saved through faith in him. On the other hand, men are so corrupt that they cannot merit salvation and rebirth in the Pure Land through their own efforts. No matter how much a person practices austerities and performs good deeds, he cannot save himself; salvation comes only through faith in Amida (Great Historical Figures of Japan, p. 105). These doctrines were taken in a quite different direction by Shinran's fiery and independently-minded contemporary, Nichiren (1222-1282). Like Hounen he was a Tendai priest dismayed by the decayed state of the world. He went on to found a uniquely "Japanese" and uniquely contentious sect of Buddhism, whose best-known branch is Soka Gakkai. 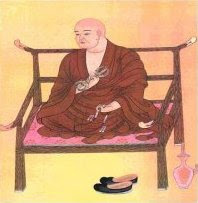 True to his Tendai roots, Nichiren based his theology on a new reading of the Lotus Sutra. But Nichiren rejected the Esoteric path offered by Kuukai and the "easy" path offered by the Pure Land disciples. He lashed out at Hounen for slighting the historical Shakyamuni Buddha (Gautama) in favor of the abstract Amida Buddha, accusing him of being a "sworn enemy of the Law," meaning, the law of causality, the universal principle underlying all phenomena and events in daily life. Whether you chant the Buddha's name, recite the sutra or merely offer flowers and incense, all your virtuous acts will implant benefits in your life. With this conviction you should put your faith into practice . . . . Even a tarnished mirror will shine like a jewel if it is polished. A mind which presently is clouded by illusions originating from the innate darkness of life is like a tarnished mirror, but once it is polished it will become clear, reflecting the enlightenment of immutable truth. And what is the polishing tool? Soka Gakkai's famed Namu-myou-houren-gekyou nenbutsu, a ritual, prayer, and sacrament rolled into one. This nenbutsu Nichiren derived from the Lotus Sutra, but unlike Shinran he further defined the nenbutsu as part and parcel of an "assiduous practice" to be exercised morning and night, and supplemented by additional acts of faith, study and missionary work. I don't think it too far a reach here to compare Nichiren's Buddhist counter-reformation to Joseph Smith's efforts at bridging the Catholic/Protestant chasm between works and grace. Like Smith, in contrast to the prevailing grace-centered faith, Nichiren essentially preached that salvation comes by grace only "after all we can do" (2 Nephi 25:23). And as with Mormons, to followers of Nichiren "all we can do" means much effort. No free ride to heaven here. Also paralleling Smith, Nichiren separated himself from the mainstream religions by declaring his to be the one true Buddhism. All others were false, misguided and heretical. In tones that would sound familiar to observers of modern, politically-active religious movements, Nichiren proclaimed that things were going to hell in a handbasket precisely because the people were following after the wrong Gods and the nation's leaders weren't hearkening to his message. The government begged to differ and sent him into exile. It might have been for his own good, for on several occasions he was set upon by mobs and almost killed. He was pardoned three years later, but stirred up trouble again and was exiled a second time. This time he escaped on his own accord and consequently avoided re-arrest precisely because things were going to hell in a handbasket. Nichiren had proved uncannily prescient in prophesying the Mongol invasion of Japan in 1274 and the government thought it best not to tempt fate. It was not only his confrontational character that made him so many enemies ("I am certainty the most intractable person of all Japan," he wrote shortly before his death), it was his redefinition of the relationship between church and state. Unlike the Shinran, Saichou and Kuukai, Nichiren had no familial connections to the aristocracy. This fact he took advantage of, rejecting the hierarchal leanings of Tendai and Shingon and styling himself a low-born commoner, a "man of the people." He couched his arguments in terms of national exceptionalism while proclaiming the imminent threat of apocalyptic doom and a utopian vision of a perfectible society to be established in the here and now. For [Nichiren] religious ideals were inseparable from society and had to be realized in society. Salvation could not be achieved only at the level of individual meditation, because, first, no individual exists by himself, and secondly, because a living being can only realize itself through action and not by mere spiritual activity (Great Historical Figures of Japan, p. 112). But while all the same ingredients were there, this 13th century Buddhist "reformation" did not directly threaten the existing political order. To be sure, Nichiren's stridency inflamed passions and raised the hackles of secular and religious leaders. And half a century earlier, in 1207, Hounen and Shinran had been defrocked and exiled and the Pure Land sect banned. However, only four years later the ban was repealed and they were both pardoned. Ever since the founding of the Japanese state in Nara there had certainly been no separation of church and state, but the upper hand had always been held firmly by the state. The only ceremonial imprimatur a warlord ever sought was that of the emperor, and emperors were easily replaced. Add to this the fractioning of Buddhist belief into competing sects from before the time of Kuukai and Saichou and it was simple politics to play one side off against the other. As a result, with the exception of the Tokugawa anti-Christian purges (confined mostly to Kyushu but lasting a quarter-century) and the post-Meiji anti-Buddhist purges (lasting less than a decade but nationwide), the notable incidents of religious conflict in Japanese history were short-lived and regional in scope, in no way comparable to Europe's continental-wide Thirty Years' War. Which is not to say that they were not at times extremely bloody. The most horrific examples of religious violence arose when a shogun or military leader perceived that a particular sect was giving aid and comfort to a secular enemy. In the mid-12th century, Taira no Kiyomori ordered a military assault on the monks of Nara, whom he felt were showing undue partiality to his implacable foe, the Minamoto. What followed was the infamous "Burning of Nara," a conflagration that killed 3000 and destroyed most of the city's temples and monasteries. In the 15th and 16th centuries, during the Warring States period, the collapse of central authority again allowed a number of prominent Buddhist sects to enter the political arena, in some cases governing entire provinces, as did a Ikkou (Pure Land) sect in Kaga prefecture, from 1488 to 1531. For four years during the 1530s, in what is known as the Hokke Ikki (Lotus Uprising), followers of Nichiren took over the city of Kyoto. The uprising ended in 1536 when Enryaku-ji Tendai warrior monks descended from Mt. Hiei and leveled all 21 Nichiren temples, burning a good portion of Kyoto in the process. The tables were turned in 1571 after Enryaku-ji allied itself with the warlord Takeda Shingen, who opposed Oda Nobunaga's Napoleonic campaign to unify the country. In retaliation Nobunaga razed the temple complex to the ground. The death toll at Enryaku-ji alone is estimated at 20,000. 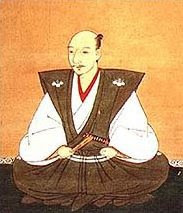 Then in 1579, in a demonstration of his brutal ecclesiastical neutrality, Nobunaga had three prominent Nichiren clerics executed and forbid Nichiren Buddhism from being proselyted in Kyoto. In ironic contrast to the Nobunaga's merciless battles against the Tendai temple on Mt. Hiei and the Pure Land temple at Ishiyama Hongan was his partiality to the recently-arrived Jesuit monks. This was in part motivated by a sincere curiosity in things foreign. But he also saw Christianity as a check on the militant Buddhism, and Nobunaga learned to deploy the modern weaponry supplied by Portuguese traders with devastating effectiveness. His sympathies toward Christianity was in no way shared by his successors. Of Nobunaga's religious pogroms Billy J. Cody notes that, "His purpose was not the extermination of their religion, but only [their] political and military role" (Great Historical Figures of Japan, p. 165). But beginning with Hideyoshi and culminating with the establishment of the Tokugawa Shogunate the goal of the government was the literal extermination of Christianity from Japanese soil. However, again, it is difficult to tease out of this extreme antipathy towards Christianity any kind of interest in or dispute over doctrine. It was a simple matter of geopolitics. The Jesuits had had their greatest success in the provinces of Kyushu and southern Honshu, claiming among their passionate converts a number of prominent daimyo, or military governors. After the turning-point battle of Sekigahara, many of these Christian samurai ended up on the wrong side of history. One fear familiar to European politics was that Catholics were ultimately beholding to Rome, that they could call upon Spain and Portugal for arms and material support in resisting the unification of the country under a "pagan" banner. For the increasingly xenophobic Tokugawa, after a century of civil war the mere possibility was an intolerable one. That Ieyasu's principal foreign advisor was Will Adams, a Protestant Englishman, surely did not help. The brutal campaign against the Catholic community ended at the siege of Hara Castle, 40 miles east of Nagasaki on the Shimabara peninsula (during which a Dutch warship offered token support to the shogunate). When, in 1638, the castle fell after a three month siege, some 37,000 Christians, along with their allies and sympathizers, were killed or executed. The Tokugawa government restricted all foreign trade to a single port in Nagasaki manned by a single Dutch envoy, and then embarked on the most successful gun control program in history. The last thing a feudal regime desires is the "great equalizer" in the hands of an overtaxed peasantry. It was not all misplaced paranoia. Two-and-a-half centuries later the Tokugawa government would be overthrown by Nagasaki's neighbors, the Satsuma and Choshu clans, well-armed with western military hardware. A small Christian diaspora survived Shimabara, practicing in secret, not to emerge until the 1868 Meiji Restoration. The Meiji Restoration also saw the last incidence of state-condoned religion-on-religion violence, this time between Shinto and Buddhism. The Tokugawa regime had adopted Neo-Confucianism as its governing ideology, which itself drew on a philosophical foundation of Buddhist metaphysics. Following Kuukai's original formulation the native Shinto religion, upon which Japan's imperial system was founded, was subsumed into the Buddhist ecclesiastical order. In Confucian terms, this was necessary to compensate for the fact that, unlike in China, the emperor reigned but did not rule, an oversight the Meiji Restoration intended to rectify. But with the de jure restoration of the Chrysanthemum Throne Buddhism was disestablished, the two religions were disentangled, and Shinto was elevated in its place. Not only had "outsider" provinces such as Satsuma and Choshu chafed under the long "dictatorial peace" of Tokugawa rule, followers of Shinto had also deeply resented their subordinated status. With the acquiesce and often the cooperation of the nascent government they took revenge. During the rampage that followed (the Haibutsu Kishaku), thousands of Buddhist temples and monasteries were looted, vandalized and burned. Over 18,000 temples were closed, their lands confiscated. Shinto shrines were removed from Buddhist temple grounds. "Blue laws" prohibiting the eating of meat by Buddhist clerics and marriage among monks and nuns were overturned. Clergy supported by the state were forcibly laicized. Unlike previous anti-Buddhist purges the violence was mostly limited to property damage and it had spent itself by the mid-1870s. The role of state Shinto was strengthened during the first half of the 20th century and became closely entwined with Japan's war effort. In 1945 it was Shinto's turn to be disestablished. Today, aside from controversial state visits to Yasukuni, the Shinto shrine where Japan's war dead are interred, and the very occasional coronation ceremony, the relationship between church and state in Japan resembles that between the Church of England and the British throne--symbolic, not theological, in execution. In sectarian terms, 1945 marked for Japan what Francis Fukuyama has termed the "end of history," the end of social evolution rising out of marked ideological conflict. At this point, "genetic drift" (or perhaps "meme drift") takes over and a regression to the mean begins. With a vengeance. An international survey conducted in 2002 found that in the United States, 59 percent of poll respondents claimed that religion was "very important" in their lives. For Japan it was 12 percent. More revealing was a 1996 Japan Agency for Cultural Affairs survey that reported declared church membership as 194 million, 54 percent higher than the total population, meaning that a significant proportion were claiming simultaneous membership in two or three quite different religions. Shinto and Buddhism have achieved a balance of practice and belief that almost suggests careful negotiation by a higher power. Coming-of-age ceremonies from birth until marriage are oriented in Shinto rites, while Buddhism continues until death and the hereafter. This can be seen in the two biggest national holidays: Hatsumode, the New Year's visit to the local Shinto shrine, and the August Obon, the Festival for the Dead, with its roots in the Urabon Sutra. Christianity has brought widespread (commercial) recognition to holidays such as Valentine's Day and Christmas. Wedding ceremonies are often conducted according to Shinto rites, with a generic "Christian" reception following. This laissez-faire approach can cause spiritual dilemmas, leading Dean Gilliland of the Fuller Theological Seminary to ponder whether Christians who participate in Hatsumode are possibly "flirting with spiritual danger" and committing idolatry. Dean Gilliland suggests a compromise, that the celebrant "participates with his family in the act of going to the shrine and enjoying in the festival atmosphere, but does not participate in anything with more religious connotations." A nice solution, though I must confess that, as Mormon missionaries, my companions and I attended Hatsumode, pitched a few coins into the box, took lots of pictures of the cute girls in gorgeous kimono, and didn't give it a second thought. We found a cultural mean to regress to purely by reflex. Consider what was once the radical religious fringe, Nichiren Buddhism. Soka Gakkai's political arm, the Koumeito, or Clean Government Party, holds 34 seats in Japan's lower house, third behind the Liberal Democratic Party and Democratic Party of Japan (who together hold 368 seats). Though it generally stands in opposition to the LDP, it is considered "centrist" in political orientation. Not a wild-eyed bunch of intolerant, religious fanatics. Likewise, the Mormon church, America's one, new, "native" religion, has of late steered toward middle waters, stashing its historical baggage deep in the hold (except when it can play up its status as a historical victim), while insisting on its exceptionality. It still suffers slings and arrows from the mainstream. But Christianity has at least two hundred more years to evolve. Due to the pace and interconnectedness of things we will likely get there sooner than later. The same could be said of Islam, arriving on the world stage five hundred years after Christianity, a thousand years after Buddhism. The model places Islam in the turbulent midst of its own reformation, with all the confusion between church and state and faith and violence. Yet social evolution averages the collective behavior of individuals over spans of time, making it difficult to point to statistical outliers as harbingers of change when one is immersed in the stream of history. The question remains whether this or that socio-cultural mutation has set a trend or is a self-correcting error. Two contemporaneous examples of religious belief in extremis in Japan and the United States, the Branch Davidians and Aum Shinri Kyou, suggest not a widespread return to religious conflict, but rather exemplify the efficient social centrifuges that post-modern societies have become, spinning the heavy radicals off into extinction. So perhaps Yeats was wrong after all. Things fall apart, and as a consequence the center holds all the stronger. Though one is left to wonder, when all is spun away, what of a passionate, sectarian nature will be left behind.